Jyoti's Pages: On Decluttering Memories - Does it Spark Joy? Have you had people in life who at one time were very close and special to you and over the years drifted away and became as good as strangers? I think many of us would nod a ‘yes’. We all go through that thing at some point. Let me tell you that I know how it feels. In my case, nothing actually went wrong. We just drifted apart and went on our ways. And today just sending a ‘hi’ on Facebook or on any other social media platform seems like a huge effort and I so can’t bring myself to do it. Coming back to my ritual I was about to indulge in – so I went there and opened the cupboard and to my absolute shock I find that most of the things are missing – just a few of the books, an old file and no sign of that pouch! I searched for it in the whole cupboard and I couldn’t find it. So I went downstairs, to my mom, who was still in the kitchen and asked her if she had taken my things out. To which she said she did clean that shelf last year on Diwali. She said some of the papers in there were getting infested with pests. I was just at a loss for words! I almost felt like crying. My mom had done away with some of my fond memories. Some things are special not for its monetary value, but for the memories, they remind you of. Those letters, cards, notes were so special to me; it reminded me of the good times I had – something I will cherish forever. But there is another facet to it, whenever I went over those things, I would be sad and would ponder over how relationships change, how coldness creeps into a warm and friendly bond and how we stop caring for things that meant the world to us at some point. That day I was lost the whole day, fervently hoping that maybe I will find the pouch tucked away in some corner in the house. But I didn’t. And slowly came the realization that maybe it was time to let go of all those things, maybe it had served the purpose it had to and it was time to stop holding on to them. This whole episode reminded me of Marie Kondo and the famed decluttering technique – KonMari. One of the core principles of this decluttering technique is – only keep items that spark joy! In that line, I got my answer. That is one incident that led me to choose my word of the year – Declutter. I have quite some decluttering to do – both physically and emotionally and that journey is on. It is not that I will forget my friend and all the memories. She is one to whom I owe my love for reading and books. 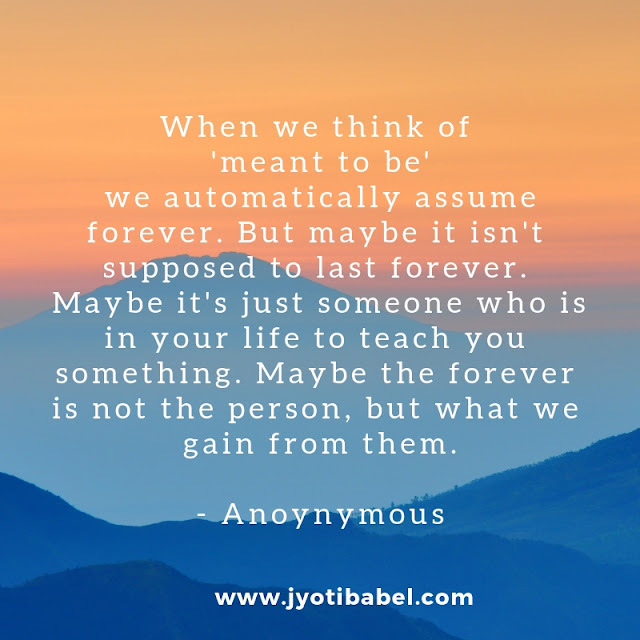 But as the quote I have shared at the beginning of this post says - maybe the forever is not the person, but what we gain from them. Linking this post to #MondayMusings by Corrine at EverydayGyaan. Fact dear.I can feel how sadness lingers for sometime that we get lost in moment. Definitely you can't forget them but you will grow stronger afterwards. Loved the writeupwrand quote.